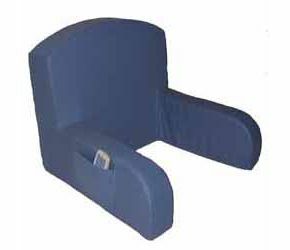 Backrest With Arms, To Aid Sitting Up In Bed. After buying one for my mum who was suffering from sciatica and hearing it helped her greatly,I bought one for myself.I'm a wheelie user and tend to use my back and arms to support me and stay sat up in bed which in turn causes them to pain too.This back rest takes all the effort and pain away.I can't recommend it enough for anyone who has trouble sitting upright.It is so sturdy the arms are strong enough to take weight if you do start to slide down after sitting a while and need to push them to lift yourself up.It really helps mum support her arms while reading to.You won't be disappointed and will wonder how you ever managed without. I had been looking for something like this for my wife who has OSA and has trouble breathing when sleeping and this helps her sleep at night by keeping her upright and not lying on her back. This item is dear but it is dearer on other sites i bought cheaper ones but this is the best and the old saying is true you get what you pay for and if your looking at this item then look no further you have found what you need i have no regrets as the wife's sleeping better using this backrest.